Scroll down for links to the articles and interviews. CRASH, BOOM, POP! : Money & Economics Exposed is a tongue-in-cheek graphic novel or cartoon book series by Genevieve Tran, Miguel Guerra and Suzy Dias, created with the help of economist Steve Keen, author of "Debunking Economics". We literally illustrate the alternative in a fact based comic book series that uses humor to challenge the mainstream. We want reading about economics and money to be as easy as reading comic books. Too many of us are living paycheck to paycheck. Income inequality is a worldwide problem. Students are graduating with record debts. Trillion dollar wars are charged to the national credit card of debt. We’re inheriting economies in crisis, yet less than half of all U.S. high schools require any kind of economics or finance courses in order to graduate. There'a a growing eagerness to learn more about the economy. How do we know? In October 2014, we launched a successful campaign and raised over $35,000! We are humbled and working hard to create something meaningful and witty that will spark discussions and imaginations. Click here to watch our Kickstarter video. Click here for the sample. Final pages will be in full color. CRASH, BOOM, POP! aims to help lay a good foundation in economics. We want to expose how money and economics actually work, without the complicated rhetoric. Everyday questions that befuddle our brains like: How is money created? Why do housing prices keep rising? Why are interest rates at all time lows (even if your credit card interest may not be)? What’s the purpose of austerity? Why do central banks, like the Federal Reserve, continue printing more currency? These are baffling questions for many...including actual economists! Yes, that’s right. Much of what economists actually believe - and teach in their incredibly boring textbooks - is wrong. ..the truth is that a dollar of capital in a bank can actually result in eight or ten dollars of loans to families and businesses, a multiplier effect that can ultimately lead to a faster pace of economic growth." Confused? So were we. Then we read some books that cut through the confusion: Steve Keen’s “Debunking Economics”, Ann Pettifor’s "Just Money - How to Break the Despotic Power of Finance" and Ha-Joon Chang's "23 Things They Don't Tell You About Capitalism", just to name a few. As a team with a background in finance, education and economics, we did our best to digest all of this information for you. Now we want to share what we’ve learned. Suzy Dias, and writer Genevieve Tran (watch her TED Talk on financial literacy for the next generation). Our mentor and muse is Professor Steve Keen, Head of the School of Economics, Politics and History at Kingston University London, founder of the Minsky open source economic simulator (which was successfully funded on Kickstarter), and author of the bestselling, “Debunking Economics”. For more information on Steve, click here. CRASH, BOOM, POP! 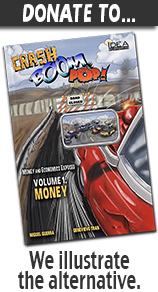 is a graphic book series with five volumes: Money, Mico, Macro, Mayhem and Method. Each will be a perfect bound graphic novel, with a final size of 6.75” x 10.5” (17.15 cm x 26.67 cm) in full color, and printed on thick, high quality paper. Volume 1: MONEY will have 96+ full color pages, with an estimated publication date of October 2015. If you would like to help with the creation and publishing of our graphic novel series, please click here. You can also help us by spreading the word about the series on your favorite social media sites, blogs and websites. We really do appreciate it!